The villas boast the serene calm of the imposing centuries-old trees in the olive grove, which will marvel you with their elaborate shapes and sculptural contortions. Complementing the privacy and independence of the villas, the location ,which is very close to Agios Ioannis beach (blue flag award) on one hand and and very close to the town of Lefkas on the other hand , offers a wealth of facilities and services. Within a 6 minutes walk or 700 meters there is Agios Ioannis sandy beach , one of the best beaches of Lefkas where you can find beachfront restaurants, bars and watersport facilities. Within a ten minute walk you you can be in the town of Lefkas with shops ,museums old churches , restaurants ,bars and an interesting nightlife. 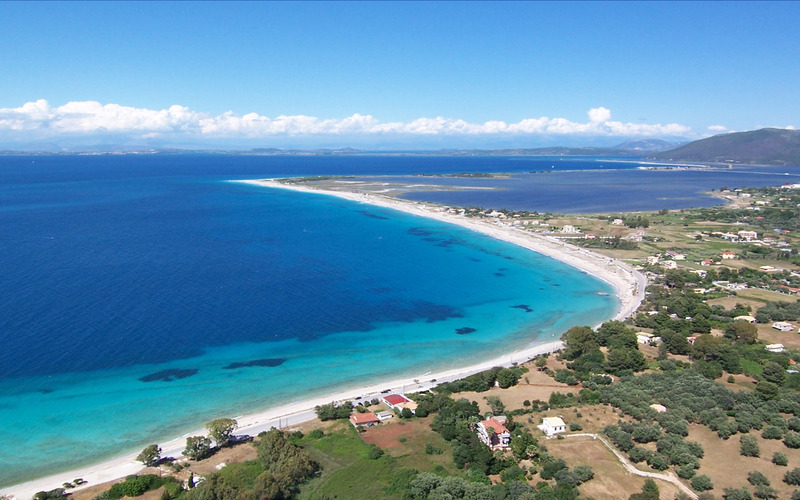 Agios Ioannis beach is the closest beach to the capital of the island; Lefkas Town. Beach bars, cafes and tavernas are peppered around the crescent shaped beach. It is a sandy beach with turquoise waters .The beach is quiet ,virgin and rarely crowded and it is extended for nearly three kilometres . Along from this beach stretches a spit of beach called Miloi after the eighteenth century windmills that stand as sentinels lined up along the waterfront, a popular area for kitesurfers and windsurfers. North of Aghios Ioannis beach is Gyra lagoon, surrounded by the flat green plains that are scattered with houses and olive groves, the road to Lefkas town has the sea and the lagoon on either side making a breathtaking ride,whilst an old fourteenth century sea fortress offers a charming backdrop. Located on the western side of Greece, in the Ionian Sea, Lefkada is among the most beautiful Greek islands. With exotic beaches, impressive nature and lovely villages, Lefkada is an ideal holiday destination for families and romantic couples. Porto Katsiki, Egremni, Kathisma ,Agios Ioannis and all the beaches on the western side of Lefkada distinguish for their fabulous water and pure natural beauty. Sivota, Agios Nikitas and Vassiliki are nice seaside villages with traditional architecture. Nightlife in Lefkada is lounge. Except for Nidri that has some all-night clubs with loud music, all the other villages of Lefkada have lounge bars for a relaxing night drink. Although Lefkada is an island, you can drive there from the Greek mainland through a small bridge. In 30 min drive from Lefkada Town, there is also the small airport of Aktion-Preveza that works only in summer and receives charter flights from Europe.